Drainage issues are a serious threat to the integrity and functionality of your parking lot. Water can compromise the integrity of your parking lot. Parking lot drainage issues result from poorly-designed drainage systems. If your lot lacks the proper drainage, you may face a variety of problems as time progresses. These drainage issues can compromise your parking lot and cause an extended loss of business due to repairs or lot replacement. Do not make the common mistake of assuming water will run off of your parking lot. Even a minor flaw in your parking lot drainage design or functionality can lead to ensuing parking lot drainage issues. Improper draining causes water to puddle, creating expansive areas of standing water. 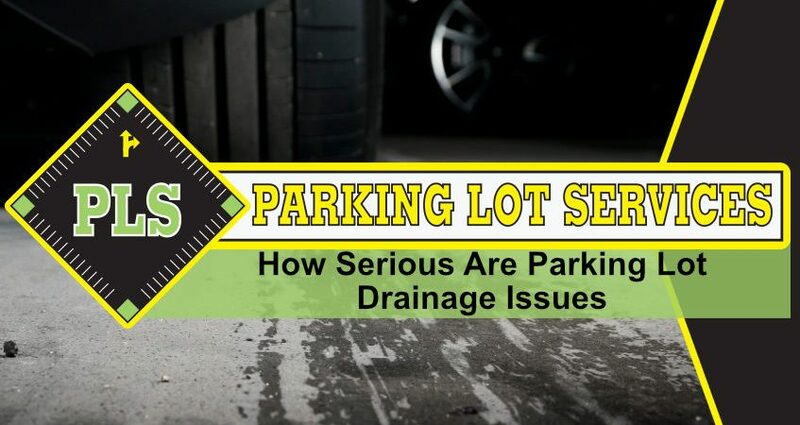 If enough rain falls or if there is a flood, parking lots with insufficient drainage have the potential to end up with several inches of standing water. Large puddles and potholes can cause hydroplaning, slips and falls, and vehicle damage. If anyone is hurt as a result of this standing water, you may be responsible for costs related to the incident. Furthermore, your business will be looked down upon, for a lack of maintenance shows disregard for customer well-being. Water is a direct threat to the bonds that keep your asphalt cohesive. If water moves down into your asphalt due to insufficient parking lot drainage, the asphalt mixture will slowly separate from the aggregates. Pooled water can also cause cracking as the water pressure forces fissures to form in the asphalt surface. Bleeding, or the movement of the asphalt binder toward the surface can also occur. Water exposure can also lead to rutting or depressions along areas with significant traffic. Such damage cannot be identified until it is too late. Be sure to take a close look at the parking lot surface for signs of standing water. It is also possible for parking lot moisture to lead to raveling. Raveling is the destruction of the upper-most layer of asphalt. Parking lot drainage systems with flawed designs, diminished functionality, or any other flaw have the potential to lead to structural damage. Water that pools on asphalt do not simply harm the surface coating. Water moves down into the parking lot, through the subgrade, creating invisible parking lot drainage issues. These unseen problems are significant as they appear without warning and prove quite costly to repair. In some cases, a full replacement is necessary as the structural integrity has compromised the safety of the entire lot. Thankfully, most subgrade damage usually results in potholes. Many parking lot drainage issues can be corrected with properly scheduled parking lot repair services as opposed to a full replacement. If your parking lot drainage systems need any work, contact PLS for information about our parking lot services in Tampa. You can reach us at (813) 880-9100. Give us a call today to find out how our paving services can address your parking lot drainage issues as well as any other problems you have with your lot.